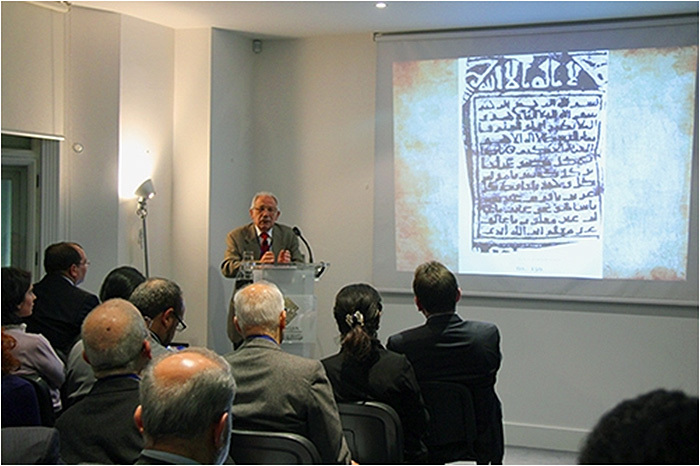 On Wednesday 28th November 2012, Al-Furqan Islamic Heritage Foundation in London organised a public lecture on The Critical Edition of Manuscripts: Past, Present and Future, delivered by Professor Qasim Al-Samarrai, professor of Arabic and Islamic studies. Professor Al-Samarrai is a member of the International Advisory Board of the Foundation for Science, Technology and Civilisation (FSTC) . After the reception and the opening words, Mr. Sharaf Yamani, member of the Al-Furqan Board of Directors, gave a short brief on Al-Furqan main work and achievements in the field of the Critical Edition of Manuscripts. He emphasised the fact that Al-Furqan has published so far seventeen manuscripts in thirty six volumes and has organised three international training courses on editing. 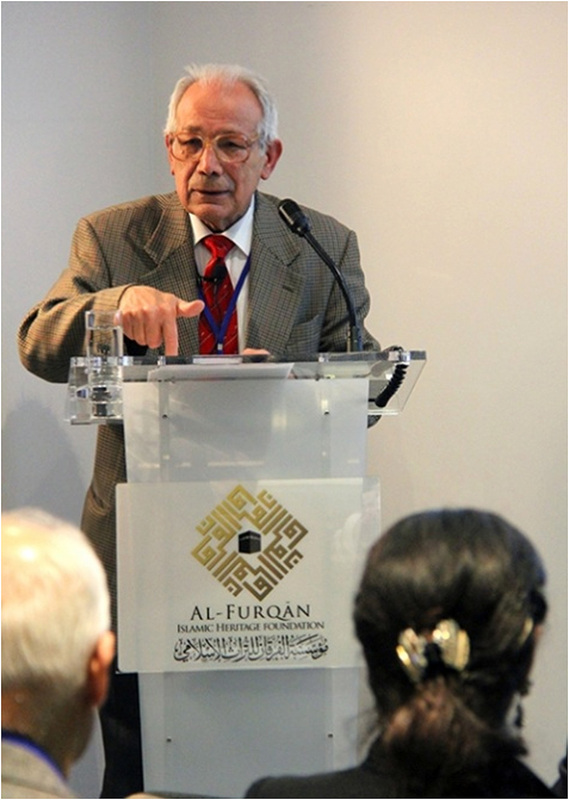 The keynote speaker in this public event was Professor Qasim Al-Samarrai, professor of Arabic and Islamic studies. His lecture on The Critical Edition of Manuscripts; Past, Present and Future was very well received. He gave an insightful view on the history of the critical edition of manuscripts; the required qualifications for an editor; the history of editing Arabic works by orientalists; and the history of printing. The lecture was followed by a very interesting discussion on the topic. At the end of the event, the new website of the Foundation was launched. Through the website, the visitors can have direct and instantaneous access to the world of Al-Furqan and its centres. So, please visit us at: www.al-furqan.com. Professor Qasim Al-Samarrai showing an example of early "block printing". Qasim Al-Samarrai, "New remarks on the text of Ibn Hazm's Tawq al-Hamama", Arabica, vol. 30: 1 (1983), pp. 57-72. Qasim Al-Samarrai, Descriptive Catalogue of Orientalist' Publications Preserved In The Research Centre, The Islamic University of Imam Muhammad Bin Saud. Riyadh : Imam Muhammad Bin Saud University, 1988. Qasim Al-Samarrai (editor), Kitab al-Ridda wa-al-Futuh and Kitab al-Jamal wa-Masir ‘A'isha wa-‘Ali. A Facsimile edition of the fragments preserved in the University Library of Immam Muhammad Ibn Sa'ud Islamic University in Riyadh, Sau'di Arabia. 2 vols. By Sayf b. ‘Umar al-Tamimi. Edited with an introduction in English by Qasim al-Samarrai. Leiden: Smitskamp Oriental Antiquarum, 1995. Reviewed by Patricia Crone, Journal of the Royal Asiatic Society, Third Series, Vol. 6, No. 2 (Jul., 1996), pp. 237-240. Qasim Al-Samarrai (co-editor), Ahmad b. Qasim al-Hajari, Kitab Nasir al-Din ‘ala al-Qawm al-Kafirin (The Supporter of Religion against the Infidels). Historical Study, critical edition and annotatted translation by P. S. Koninsveld, Q. al-Samarrai and G. A. Wiegers. Madrid: Consejo Superior de Investigaciones Cientificas, 1997. Qasim Al-Samarrai, Abbasid Gardens in Baghdad and Samarra (published 7 November 2002). Click here for the full article in PDF. Qasim Al-Samarrai and Muhammad Yasin Mazhar Siddiqui (editors), Catalogue of Arabic Manuscripts in Aligarh Muslim University, India. Vol. 1. London: Al-Furqan Islamic Heritage Foundation, 2002, Hardcover. Qasim Al-Samarrai and Ali B. Al-Samhudi, Wafa al-Wafa Bi-Akhbar Dar al-Mustafa. London: Al-Furqan Islamic Heritage Foundation, 2002. Hardcover: 2615 pages.